It was a busy day - I spent a lot of time figuring out some new tricks with the Gypsy. I am starting to find ways to make the sorts of complex designs I have been doing on Design Studio. There are some tricks to getting all of the welds to work and I will make some videos to help show what I have learned by experimentation. I also spent quite a while trying to figure out how to get a better screen image of the Gypsy for videos - I think I can do it but it is a multi-step process so will take me some time to edit and upload each video. (I was not happy with the resolution when I used the Flip camera to make the video of the screen in action). In the meanwhile, I thought I'd share yet another version of the Tri shutter card - this version is super simple to make because there is no layering. 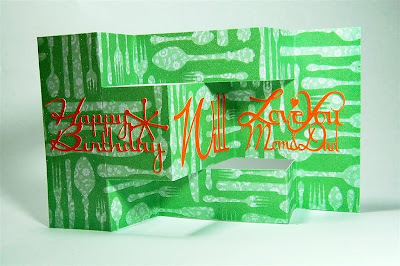 By choosing an interesting patterned cardstock you can avoid the measuring and adhering of all the layers. Here is a LINK to prior posts with tri shutter cards - there are so many variations possible and they are quick to make but always get a nice reaction from the recipient. This card was for our older son. 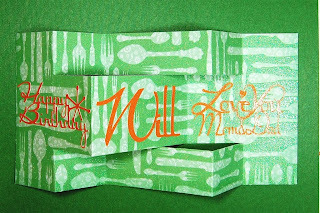 He lives in San Francisco and is a bit of a "foodie" so I chose some glittery cardstock from the Nana's Kitchen DCWV stack that is full of knives, forks and spoons. One of the restaurants we went to with him when we visited last fall was called "Spork" (named for the camping utensil which is a combination of a fork and spoon). With Design Studio, it is a simple matter to set up the words to cut to fit in the three panels across the center of the card. 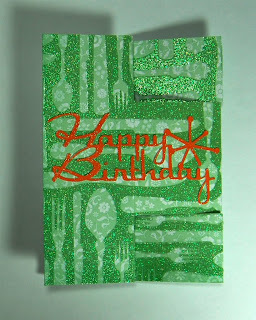 I did not layer a mat beneath the words because I wanted all of the cutlery on the cardstock to show. 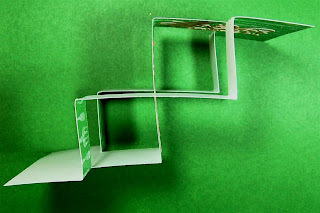 Just as a reminder - here is the view from the top of the card - the mechanics are simple but the effect is impressive! I used the Lyrical Letters cartridge for this card - the "Happy Birthday" and the "Love You" were images already welded on the Cartridge and I added the rest - welding everything together. When the card is folded it fits nicely in a standard A2, "invitation" size envelope. If you need more room for a message you can add a handwritten note to the back of the card. The heavy glittered and patterned cardstock from the DCWV Premium Stacks is a great choice for these cards. There are often sheets in a stack that I like but I sometimes have trouble finding a way to use them for a scrapbook - so I am using them for cards and enjoying the results! Click the link to go to the Giveaway post and follow the directions to enter your name for a chance to win - remember, only comments on the original post will be used to find the winner on my blog and this person will then have a chance to win a Workbox - good luck to everyone! Super card! Your son will love it! I really like the paper & the design. I'm going to try to make one of those! :) TFS! This is awesome!!! I have been trying to find instructions on how to make one of these cards. I really appreciate your post. Glad to hear you're figuring out the "tricks" with the Gypsy. I knew you would! Do you know how to burp with the Gypsy? The Gypsy does not seem to need "burping" - I have welded multiple items inside a frame and not had any trouble with the welds. In some cases you may need to add things in the correct order - my post about "Grouping with the Gypsy" on October 8th goes into this a little. I am still experimenting and they are still changing and updating the Gypsy - I hope that it will all work out with no "burping" required!